Let's Have a Delicious Persian Dinner with Live Music! We will have another event in February. For the ones, who have not experienced the event with us before, we will have a persian dinner together and then we can dance together with the live music. Protected content restaurant is a well decorated restaurant with a persian and non-persian menu. 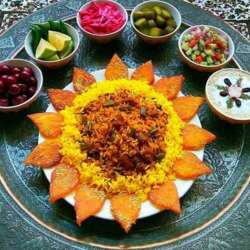 In the persian menu there is appetizers, main courses and desserts. Since we have a limited number of attendants, PLEASE do not sign up if you are not sure that you can attend the event because you will deprive the others of the opportunity to attend the event. I kindly ask you to cancel at least 24 hours before, so that the others can still sign up. I thank you in advance. After the dinner, whoever wants can participate in our donation to the doctors without borders, a non profit Organisation, that helps the poor patients around the word, especially in crisis areas. Looking forward to see you and have a nice event together!